The Accra Metropolitan Assembly (AMA) says it is set to embark on evacuation and demolishing exercise along the major storm drains in the capital to give way for a desilting drive. The exercise is expected to begin at the Odorna drain and its environs. According to the AMA, the desilting exercise was supposed to have started earlier but activities of squatters along the drains have delayed the project. In an interview with Citi News, head of Public Affairs at the AMA, Gilbert Nii Ankrah said notices have been served for the evacuation to take place this week. 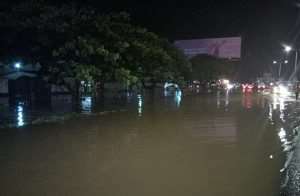 Some parts of the capital city got flooded after a downpour on Sunday evening as Ghana enters the rainy season, where such weather is expected. Some places including the Kwame Nkrumah Interchange, Kanashie, Avenor among others saw major flooding making some roads unusable. A man was also found dead at Awudome in Accra after the downpour. Speaking before the Sunday evening flooding, Mr Ankrah gave an indication of the AMA’s plan to desilt the drains. “Currently the Odaw stream going all the way to the Korle is going to be desilted from next week. The main reason why that has delayed a bit is the illegal structures that have sprung around that very enclave. But we have given them notices and clearing have begun,” he said.